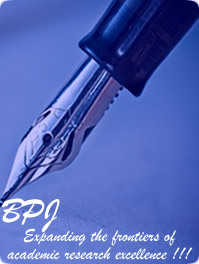 BluePen Journals is a privately sponsored organization and does not receive funding from any institution/government. In other to be self supporting, handling fees are required from authors; to finance the operation of the organization. The processing fees take care of journal operations� expenses such as internet services, employees� salaries, electricity, tax, hosting fees, etc. Also, BluePen Journals does not receive payment for subscription because it is an Open Access Publisher, which allows free access by all users, to its publications over the internet. Submission of article(s) by authors is free of charge. However, a fair handling fee for processing of articles is received from authors ONLY after their manuscript(s) have been accepted for publication. Specific processing fee to cover the cost of publication of an article is stated in the �Instructions for Authors� of each Journal.